The best we found! 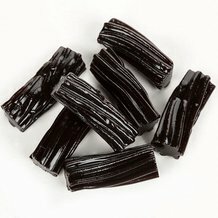 Most black licorice contain just sugar and coloring. 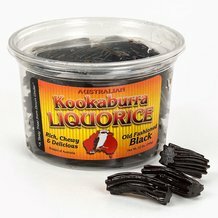 But Kookaburra black licorice has real licorice root extract for a distinct flavor (some folks even think it's good for you). Note: May contain traces of peanuts and other nuts. IMPORTANT: Due to regulations, this item cannot be shipped to California. Ingredients: Treacle, wheat flour, wheat syrup, molasses, raw sugar, water, modified food starch (corn), palm oil, caramel color (from wheat), licorice extract, natural flavors, salt, soybean monoglyceride (emulsifier), artificial colors (FD&C blue #1, FD&C red #40, FD&C yellow #5). Contains Sulphites (sulfur dioxide). * Percent Daily Values are based on a 2,000 calorie diet. Your daily values may be higher or lower depending on your calorie needs.Not a significant source of saturated fat, cholesterol, dietary fiber, Vitamin A, Vitamin C, calcium and iron. So soft, so flavorful, so hard to find! A wonderful product! Best I have tasted. I will be ordering more. This licorice is sooo soft and has a great flavor! Best soft licorice I've ever had!